What moves someone to be what they will be? If the answer was so simple, we would not have those drowning in distractions. We would not have others in painful anxiety about their lives. We would not have resentment in the world. All that would be left were those immersed in self-satisfaction, for they had the answer on how they should lead their lives towards a destination of upmost happiness. Of course the gift of life is in its mystery, of what will be right around the corner. Yet somehow, that mystery turns from a blessing into a curse as society encumbers most with not so much obligations as liabilities, which then themselves become more determinant factors for what a human will be rather than his own freedom. The quintessential actor on the stage of life which defines human freedom is the self-proprietor chef. Even beyond the artist, a chef’s life is borne out of some madness inside of him, for willing to commit his entire being toward the pursuit of perfection every exhausting evening. And in all likelihood, such pursuits will end in failure, because it is simply an excruciating business to participate in; it is beholden only to those cursed with finding no other way to be other than as this essence; which is amusing then to consider them cursed as they are gifted with the full knowledge of what is their maximal being and not left to wonder what could be as the castaways of society are poisoned by. 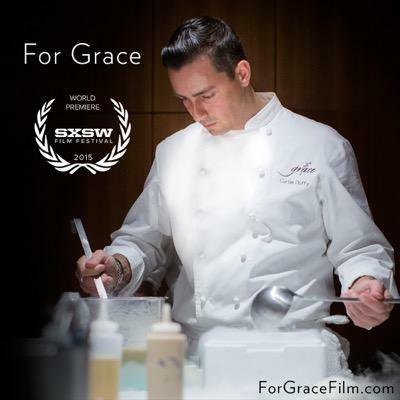 For Grace is the telling of such a story of perfection, as it chronicles a young chef and his troubled background ever so slightly. The focus, of course, is the actual creation of a new restaurant in Chicago, and yet deftly we are revealed that the chef’s father committed a heinous family crime which, to call it traumatizing would be an understatement to a child. What’s inspiring here is that the Chef was able to overcome this tragedy, this uncontrollable blight upon his existence, and calmly, silently, create a magnificent contribution to the world. No, it is not magnificent because his restaurant ultimately receives three stars from Michelin. It is magnificent because he was not deterred to elevate mankind in his own way and that is with taking a subsistent craving, a need for living, and transforming it into splendor. He was willing to sacrifice his very being to make this a reality. He was and is willing to dedicate umpteen hours, really pouring his soul, into making not food but a higher being. Thus, an even more challenging question to ponder is, how does one respond to crisis by seeking Heaven and not perdition? What stirs in man that craving for something better, rather than remaining in a state of sourness? If one can learn to love life before one is confronted with such crisis, one can learn to enjoy it as weight put on the soul to make it stronger. Hence the primacy of a good humanity is a good education; and a good education will always arise from a healthy and good culture.